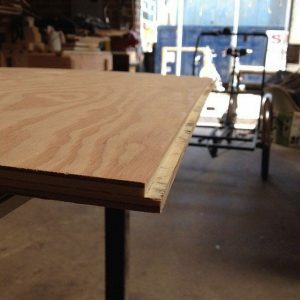 Rabbeting is a great way of adding strength to many projects, especially projects where there are shelves which need to be supported. Rather than using hardware to hold the weight of the shelf and whatever is on it, rabbet joints allow the wood itself to carry the weight. At the same time, the rabbet joint hides the end cut in the plywood, improving the overall appearance of the piece. In order to make a rabbet joint, it is necessary to cut a rabbet or dado in one piece, for the other piece to fit into. 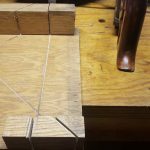 This can either be at an end, where you are making a corner or in middle of a board, where you are inserting one piece into another, making a T. In either case, the rabbet joint adds strength and beauty. The problem with cutting rabbets in plywood is that the face veneer can be split or chipped when cutting them across the grain of the face veneer. This problem can be solved in the same way that it is for Luan plywood, by cutting through the face veneer with a sharp utility or hobby knife. In cases where the rabbet is to be cut in the middle of the board, rather than at one end, cut both sides of the dado with the knife, spreading the cuts out a shade larger than the cut will be made. •	With a dado blade on a table saw or radial arm saw. This allows you the greatest amount of control over cut width and depth. However, you need a quality dado blade. Some dado blades vibrate a lot, which increases the chance of splintering. The type with dual outer blades, sometimes referred to as a “stacked dado” is better than the kind that wobbles to cut the dado. •	With a standard saw blade on a table or radial arm saw. This can be called the “poor man’s dado” as it doesn’t require purchasing a special blade. Instead a series of cuts is made with the standard crosscut blade, removing the material to create the dado. •	With a rabbeting plane. Once upon a time, all rabbets were cut with planes. This can still be done with plywood, although there are several problems. First of all, rabbeting planes are usually 3/4″ thick, so they won’t work for thinner plywood. Secondly, it is very hard to crosscut smoothly with a plane and finally, there is a greater chance of splintering with a plane, than with a fast-moving saw blade. Ideally, any rabbet should fit snugly, but no so snugly that it requires a rubber mallet to pound together. You want enough room between the pieces for gluing, without leaving any gaps. So, measure the material thickness carefully and always make a test cut on scrap, before committing to cutting any of the pieces for your project. Well made rabbets can be connected without hardware, if the plywood is thick enough to provide sufficient gluing surface. The parts should always be clamped together as the glue dries, to ensure a tight joint. Finishing nails through the flat and into the end of the crosspiece will add strength, and help prevent the parts from coming apart while working on them.